Apparently the judge bought the argument that Morgan is being used for research and education. Guess he or she has never been to a Loro Parque Orca Ocean show. I have, and what amazed me was that there was not a single fact about wild orcas in the show. Not one. 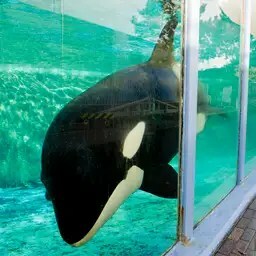 AMSTERDAM – The relocation of orca Morgan of the Dolphinarium in Harderwijk to Loro Parque, a park in Tenerife, was not unlawful. That the court in Amsterdam Thursday determined. The case was brought by the Orca Coalition, an alliance of animal activists, who wanted the animal in nature would be released. Morgan was severely weakened in 2010 found in the Wadden Sea. The animal was brought to the Dolphinarium to recover. In 2011 it was announced that Morgan to Loro Parque in Tenerife should move, where all five other killer whales lived. Then State Secretary Henk Bleacher gave a permit for the removal of Morgan to Tenerife. This was according to the Orca Coalition never happen. The permit should only be issued if the goal was their research or teaching was that the protection or conservation of the species was intended. This is according to the court case. The park on Tenerife conducts research and performs an educational function, the judge said. The Court sees no reason to believe that the welfare of Morgan danger in Tenerife. The Orca Coalition may, if they disagree, a case in Spain started. PLUS: Comment from The Blackfish. hey tim, do you remember some human from our recent past that had the courage and the guts to step out and decide against human economic interests for something that was a right thing to do even if this signify starting an unprecendented “case” and a “war” ? i dont. But again, it appears greed has won over common sense yet again. FWIW, I don’t think the court is corrupt. I think there is a much deeper problem, which is that our human culture, and the laws and judges it produces, operates from a misguided or anachronistic value system which simply doesn’t place a priority on orcas or the environment. So the real goal has to be to change human culture. Easy, right? It’s easy to believe the corruption and blame it on that, but its just amazing that this outcome was possible. It feels like that. But I know what you are saying and I know what you mean. It’s just frustrating to constantly see history repeat itself and people never seem to learn from the past mistakes. Making the changes to the way we see and value our world, like you say is the tough part, and until we do, I just fear that humanity is still on a crash course. Tenho certeza que o juiz foi comprado, foi subornado pelo park, deve estar correndo muito dinheiro por fora e esse juiz deve ter enchidos os bolsos, pelo que se viu não é sincera a preocupação dessas autoridades com o bem estar de Morgan, adiaram a decisão para vasculhar mais argumentos para tapar o suborno, todos que fizeram parte da decisão de Morgan certeza foram subornados, encheram os bolsos de dinheiro, o que é uma vergonha sendo pessoas da justiça!!!!!!! I cannot believe that this decision was made. I cannot believe that after seeing the videos and listening to strong testimony . . . a decision was made that does not protect this suffering being? We can’t give up on this creature. What more is being done? Who else is continuing the fight? What other options do we have to help? What more can we do?